It's funny but not necessarily without some truth about possible stage-managing by Scott. It is a long time since I read Huntford's book but I do remember it being pretty damning and though generally negative, truthful. Until it was mentioned in this thread I had forgotten the stuff about Scott stage managing the final death scene; that I do find a bit hard to believe. I didn't want to trivialise a serious discussion but now that Red Dwarf has been mentioned I have to admit that ever since the first posting I have had the mental image of Terry Jones as the bogus polar explorer in Tompkinson's Schooldays (Ripping Yarns) stuck firmly in my head. I suppose it is an indication of how far Scott's reputation and probably the Imperial ideology he typified have fallen; now they are a matter for satire and ridicule. Also Monty Python's 'Scott of the Sahara' sketch - assuming that is not the same thing. 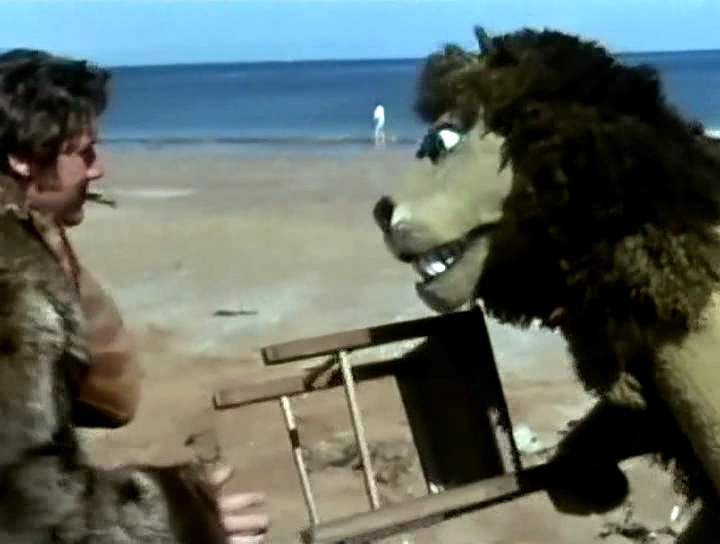 "I get to fight the lion!" Amundsen spent a considerable time in the Canadian Arctic living with the indigenous people. He learned how to handle dogs and he studied their clothing. They wore clothing that was fur-lined and very warm; Amundsen had several sets of this clothing made for his team. Scott and his team wore canvas outer clothing. Given that Scott had been on an Antarctic expedition before his preparation and equipment is unfathomable. All true...And yet when Amundsen's party reached the Pole, they were wearing the same Burberry wind proofs as Scott - modified slightly by having the hoods sewn into the smocks. Scott's had detachable, buttoned on hoods. And in the right thread,now (in response to vandermolen's reply in the Walton thread! Confused?!! ) about the cd of Boult's emi stereo recording of Job (paired with the Concerto for two pianos & orchestra). Now,I remember! The Barry Wordsworth recording of Job coupled with The Perfect Fool suite?!!! Yes! That's the first one I had....not the Handley cd. I remember I tried to find a s/h copy a while back,and sellers were asking ridiculous prices (okay,perhaps they've got bills to pay?!!)!! Yes,I liked that! Why did I get rid of it?!! An infatuation with some other composer? I needed the money?!!! Another cd I wish I'd kept!! Yes,I looked it up! I liked the fill-up (horrible term!). Yes,I think you're right about that! I'm glad it's going to be reissued! Good news! A question,now. Is the Boult recording of Job on Belart the mono recording? I presumed it was;but the reviews below are a bit confusing!! I understand there was an earlier recording by Boult,too. Have you heard it (If it exists I'd be amazed if you haven't!) And has it ever been released on cd? I enjoyed listening to VW speaking at the end of the Belart cd ,of Boult's momo recording Symphonies 4 & 6,very much!! A question,now. Is the Boult recording of Job on Belart the mono recording? I presumed it was;but the reviews below are a bit confusing!! I understand there was an earlier recording by Boult,too. Have you heard it (If it exists I'd be amazed if you haven't!) And has it ever been issued or released on cd? There are four studio recordings by Boult plus the one from the concert on 12th October 1972 (what would have been VW's 100th Birthday) issued on the Intaglio label which might be a pirate label. 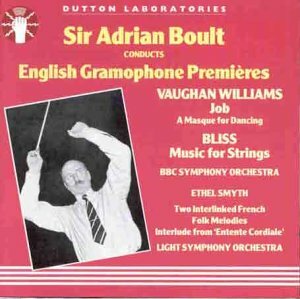 The studio ones are the first and last - both on EMI (now Warner) the earliest one was on a Dutton CD entitled something like 'British Premiere Recordings' Bliss's Music for Strings was on the same CD. Then there was the Decca/Australian Eloquence then one on Everest and finally the EMI No.2. I think that only the last two are in stereo but not 100% sure. I just realised last night that I had the Boult recording of Job,on the Dutton cd,on a cd-r. I listened to it this morning. I think I downloaded it from one of those vinyl blogs. I paired the recording with VW's recording of No 4. I was aware of the Dutton cd,but wasn't sure which recording was on it? I didn't realise it had been recorded that early (1946!). I enjoyed that recording. Parts of the performance are quite thrilling. You miss the power of the big moments,though! There's something about a first recording though;and I do have a liking for old mono and the hiss of the old shellac recordings!! (Which is I tend to prefer the less interventionist approach of labels like,the late lamented,Pearl,to Dutton,for example). There's a nice selection on that Dutton cd,though. After reading your post I realised that the first recording of Job I owned was the Collins cd of Job,not the Handley!! I remember looking for it once,and being horrified by the prices sellers were asking!! I think the prices were high,the next time I looked,too! So,it's good news that it's being reissued by alto! Hope they choose some fitting artwork? It's important for anoraks like me,who are seduced by little things like that. I also think it helps sell copies. I think alto are usually quite good in that respect?! I presume the Belart cd must be the 1954 recording. It's usually cheap s/h,so I'll probably buy it at some point?!! I found this information about Boult's recordings on Amazon,and have edited it down,so as to,hopefully,avoid annoying anyone (although,the reviewer would have got it from somewhere!) I don't know about the last bit,about a live 1946 recording?! Have a look in your attic maybe,vandermolen!! 1972 : Live (centenary) perf. October 12, 1972,Royal Festival Hall,LPO/Boult Released ,subsequently,on Intaglio cd. A live recording of a January 1946 performance at Symphony Hall. Boston with Boult conducting the Boston SO,may have survived & exist somewhere?!! NB: Re: VW 6! I downloaded some transfers from out of print Lp's from one of those blogs a while back. I put them on a cd-r,as I don't like listening at a pc. One of the recordings is described as the "revised Scherzo" from VW's Sixth symphony! It's just a short separate piece!!! Unusually RVW decided to revise the Scherzo of the 6th Symphony after the work had been published and the 1st recording (by Boult) released - I have a copy of the original score. The differences are not huge but hence the LP with both versions of the scherzo. In an age where the fad to go back to the original is so pronounced I don't think anyone has revisited the 1st version of Symphony 6. Perhaps the RVW Estate would not allow it. 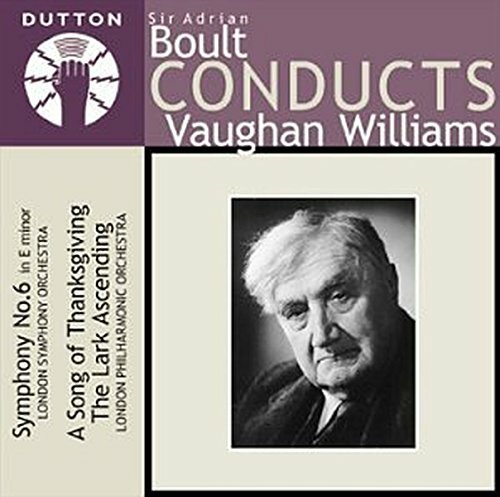 This CD (v cheap on Amazon UK) features Boult's earliest (EMI) recording of Symphony 6 but with the revised scherzo. The original scherzo is a separate track on the CD. The fill ups are v good. I especially like the Thanksgiving for Victory/A Song of Thanksgiving. I like the combination of Job and Holst's Perfect Fool on the Collins CD. After all Holst and VW were great friends. On Alto the more populist couplings will be The Lark Ascending and Greensleeves. Alto only tend to release CDs of music by individual composers. I would like the cover to feature one of William Blake's powerful illustrations for Job, on which VW's masque is based. However, you can expect a lark themed cover to appeal to fans of that ubiquitous score. I did my best! Thank you for your reply! So,that clears that 'mystery' up! Vandermolen's Dutton cd looks like a good find! I think I'll keep an eye out for that one. I'm wondering what the date of the recording (of the Sixth) on that Dutton cd is,though?! Could it be the one I've got on a cd-r,downloaded from that same vinyl blog? It does seem to figure!!) I also listened,yesterday,to a live recording of Sargent conducting VW's Ninth Symphoiny,at the Royal Festival Hall,in 1958,I gather. The audience are,thankfully,very quiet during the music making,but cough furiously and explosively between movements!! The sound was pretty good! I also listened to a very enjoyable performance of his London symphony,conducted by Barbirolli. I think it was transferred from a Pye Lp?!! And,as if that wasn't enough,a recording of Barbirolli conducting Bax's Fourth Symphony,which I really enjoyed. Also in pretty good sound,from same blog!! Please note,I always avoid anything from an 'in copyright' cd. Also,if I really like a recording,or composer,that much,I almost always end up buying it!! If I don't,it just gets chucked!! The Sixth Symphony was recorded in Studio No 1, Abbey Road on the 23-24 February 1949. The revised version of the Scherzo was recorded in the same venue on the 15 February 1950. The Dutton disc is a treasure, my favourite version of the Sixth. 'Barbirolli conducting Bax's 4th Symphony' tell me more please. Biffo is right. You must get the Dutton CD (under £2.00) on Amazon UK when I last looked. Stokowski's recording of Symphony 6 was actually the first record of the work. Boult's was released a day or two later I think. The Decca/Belart remains my favourite but that earlier recording should not be missed. The Alto CD will come out at the start of September. Thank you very much for your reply,Biffo! I will certainly keep an eye out for that recording. It does sound like (obviously,is!) a " must have"! I just saw your reply,vandermolen. Actually,I downloaded the Barbirolli of Bax's Fourth Symphony from The Art Music Forum (AMF). It was,previously,on a vinyl blog (Metrognome) It should be available at the AMF,in the downloads there. The sound quality is pretty good. The Fourth usually gets the rap for being Bax's weakest. I always like it. All that surging,bracing sea music. I love it. It also has a different atmosphere to the other Bax symphonies. It's more outgoing,somehow. Less introspective. Exuberant! Something like that,anyway?!! Yes, I rate Bax's 4th Symphony more highly than most. I actually prefer it to No.6 which many consider Bax's greatest. So do I (prefer the Fourth to the Sixth). I just had to buy Previn's recording of VW's Symphonies 3 & 4,last week,after reading through the lists of favourite recordings. I have heard the recordings before,mind;via the library (years ago) and I think I had a copy? Listening to it ,now,I can hear why the recording of the third is so highly rated. Heather Harper's solo is truly sublime. Time really seems to stand still,for a few moments. I think it might just be the loveliest ever (in a commercially release recording). I've got more s/h cd sets in the post!! The emi 2cd set of Barbirolli conducting the Sinfonia Antartica (and some other works,including,Elgar) I haven't heard his recording of the symphony!! The emi 2cd set of Berglund conducting VW (and Gibson conducting No 5,I think?) Never heard any of these,as far as I know?!! The emi cd of Barbirolli's 1954 mono recording of Elgar's Symphony No 2,which some people seem to prefer to his stereo recording (Cockaigne Ov & Dream Children,included). I like old mono recordings,so.....!! !